How long have you been with Avanti? What attracted you to Avanti? The boss as much as anything else. It was clear when I came in initially that individual opinions were valued and you would be encouraged to get involved in the growth of the business. This wasn’t just an impression – since joining, everything we spoke about has happened or is in the process. I’m now building a team below me which was my ambition from Day 1. Proudest Avanti achievement? How far I’ve come. I’m on trajectory to be where I want to be so my proudest achievement is sticking to it and being in a place where I can bill and grow a team under me at the same time. Why would you recommend a career at Avanti? If you can justify wanting to do something differently you are given the freedom to do it. 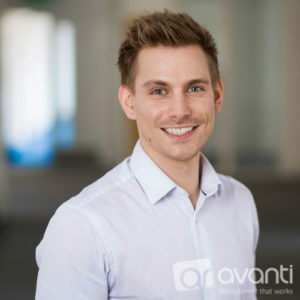 Simply put, this is so rare in recruitment that I would encourage and recommend Avanti to anyone who wants to put the work in and see results without constantly worrying about pointless KPIs.